The first thing to do is make sure there’s sufficient insulation in the hole where the dog door or cat door is installed. It’s also a good idea to add foam weather seal on the back side of the pet door frame, to create a barrier between the pet door frame and the face of the wall or door where it is installed. If this isn’t enough to solve the problem, you can use heat tape. Ask at the hardware store to make sure you buy a product safe for this manner of use. Put the heat tape across the bottom of the dog door frame. 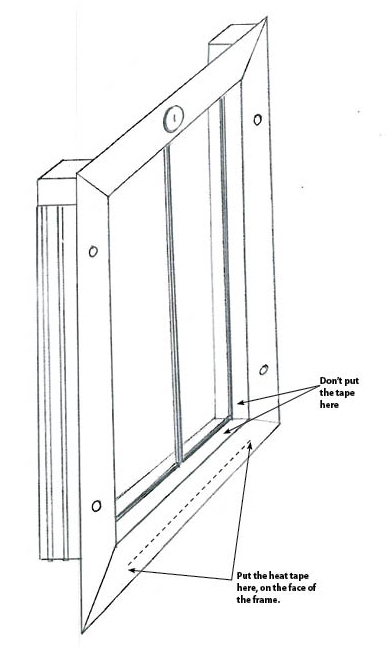 If the door still freezes at the top of the frame, put heat tape all the way up the sides and across the top as well. It would be best to put the heat tape on the backside of the frame, so it is between the dog door and the wall/door surface – that way the dog or cat can’t be tempted to play with it. If the problem stems from high humidity indoors, a dehumidifier can also be helpful in reducing condensation.